On April 30, 1940, Hal Trosky (1931 – Cedar Rapids Bunnies) went 2-3 with two solo home runs to lead the Cleveland Indians to a 10-5 win over the Philadelphia Athletics. Trosky also walked twice in the game and scored three runs. Hal Trosky played 11 season for the Indians and the White Sox. The Norway, IA native posted a career batting average of .302 with 228 home runs and 1012 RBI. Trosky was part of the 1931 Cedar Rapids Bunnies squad that finished 2nd in the Mississippi Valley League with a mark of 74-52 under manager Paul Speraw. Hal hit .302 with three home runs in 164 at bats as an 18 year old. On April 29, 1964, Tony Cloninger (1959 – Cedar Rapids Braves) threw a complete game shutout while only allowing one hit and one walk to earn the victory. Cloninger struck out five as the Milwaukee Braves defeated the Pittsburgh Pirates 1-0.
single. Cloninger became the first player in the National League, and only pitcher to date, to hit two grand slams in the same game, also setting a major league record for pitchers with his nine runs batted in. After retiring, he served as a pitching coach for the Yankees and Red Sox. Cloninger was part of the 1959 Cedar Rapids Braves team that finished in 8th place with a 53-73 under manager Alex Monchak. He posted a mark of 0-9 in 10 games with an ERA of 9.59 as an 18 year old. Casey Kotchman (2002) went 2-5 with his first HR of the season in the Rays 15-3 win over the Twins in game one of their doubleheader. Sean Rodriguez (2004-05) was 1-6 and scored a run in the win. Kotchman went 2-4 and Rodriguez was 1-4 with two RBI and scored a run in the Rays 6-1 victory in game 2. Joel Peralta (2001-02) struck out one in a scoreless 8th inning in the win. Alexi Casilla (2004-05) was 0-4 in the Twins 15-3 loss in the first game of a doubleheader. Mike Napoli (2001-02) was 0-4 in the Rangers 5-2 loss to the Blue Jays. Brandon Wood (2004) was 0-3 in the Pirates 5-2 loss to the Giants. last year they played here in Cedar Rapids. Just an update to the best of my knowledge and research on the Kernels alumni who have played in a AAA game thus far in the season. A few have been up and down from the bigs already and this list shows who might be next. The year following the player name, team and affiliation is their last year they played here in Cedar Rapids. 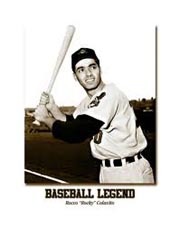 On April 28, 1965, Rocky Colavito (1952 – Cedar Rapids Indians) went 2-3 with a home run, four RBI, three runs scored and a walk in the Indians 9-3 win over the Twins. Colavito hit .266 in his 14 year career playing for the Indians, Tigers, Athletics, White Sox, Dodgers and Yankees. Hitting all but three of his 374 career home runs in the AL, he ranked behind only Jimmie Foxx (524) and Harmon Killebrew (then at 397) among the league’s right-handed hitters when he retired. Colavito finished his career with 1159 RBI. Rocky Colavito was part of the 1952 Cedar Rapids Indians team that finished in 8th with a record of 53-71 under manager Jimmy Bloodworth. Colavito hit .170 with 8 HR in 94 at bats for the CR Indians. Alexi Amarista (2008-09) went 1-2 in the Angels 2-1 extra inning loss to the Athletics. Peter Bourjos (2007) and Alberto Callaspo (2003) each were 1-4 in the game. Erick Aybar (2003) was 0-3 with a sacrifice, Howard Kendrick (2004) and Hank Conger (2007) each went 0-4 and Mark Trumbo (2006-07) scored a run as a pinch runner. Rich Thompson (2003) struck out one in a scoreless ninth inning. Jordan Walden (2008) took the loss striking out one in one inning of work while allowing one run in the tenth inning of the Angels loss. Mike Napoli (2001-02) went 1-4 with a double and two RBI in the Rangers 7-6 win over the Blue Jays. Sean Rodriguez (2004-05) went 2-4 with a double, a RBI, stole a base and scored a run in the Rays 8-2 win over the Twins. Casey Kotchman (2002) entered the game as a defensive replacement. Joel Peralta (2001-02) struck out one in a scoreless eighth inning of the victory. Alexi Casilla (2004-05) was 0-2 with a RBI, a walk and a sacrifice in the Twins 8-2 loss to the Rays. Joe Saunders (2002) took the loss as the Diamondbacks fell 8-4 to the Phillies. Saunders allowed six runs in 5 2/3 innings of work while striking out eight batters. Brandon Wood (2004) went 1-2 with a walk and scored a run in the Pirates 2-0 win over the Giants. On April 27, 1940, Lou Boudreau (1938 – Cedar Rapids Raiders) hit a pair of home runs and went 3-4 with three RBI and two runs scored in the Indians 4-2 win over the Tigers. Peter Bourjos (2007) and Howard Kendrick (2004) each had four hits and Alexi Amarista (2008-09) made his MLB debut in the Angels 8-3 win over the Athletics. Bourjos went 3-4 with a triple, a RBI and scored a pair of runs, Kendrick was 3-4 with two doubles and scored three runs and Amarista hit a two-run double in his first at bat and added a sacrifice fly later in the game. Hank Conger (2007) was 2-4 with a double, two RBI and scored a run, Erick Aybar (2003) went 2-5 with a stolen base and Alberto Callaspo (2003) was 0-4 in the victory. Tyler Chatwood (2009) improved to 2-1 on the season striking out one in 5 1/3 innings of work while allowing three runs. Jordan Walden (2008) worked a scoreless ninth inning to finish the game. Mike Napoli (2001-02) went 0-1 in the Rangers 10-3 loss to the Blue Jays. Darren O’Day (2006) struck out one in a scoreless ninth inning of the loss. Brandon Wood (2004) was 0-2 with a walk in the Pirates 3-2 loss to the Giants. David Herndon (2007) finished the game allowing a run in two innings of relief work in the Phillies 7-5 loss to the Diamondbacks. On April 26, 1962, Tommie Aaron (1960 Cedar Rapids Braves) went 3-5 with a home run, a triple and 4 RBI while scoring three runs in the Milwaukee Braves 10-4 win over the Philadelphia Phillies at County Stadium. Tommie Aaron, the brother of Hank Aaron, hit .229 with 94 RBI during his seven season career with the Braves. He hit a total of 13 major league home runs, with eight of them coming in his first year of 1962, but along with his brother’s then Major League record 755, together they hold the Major League record for the most career home runs between two brothers (768). The only other brother of a 500-home run man to play in the majors was Rich Murray, (1976-77 Cedar Rapids Giants) brother of Eddie Murray, who hit 4 home runs in a brief major league career. Tommie Aaron was part of the 1960 Cedar Rapids Braves team that went 71-69 to finish in fourth under manager Jimmy Brown. Aaron led the team with a .299 batting average and hit 20 home runs to go along with 88 RBI that season.